I ran the 10K! It wasn't nearly as hard as I expected. I ran the 10K in 54:54. Not a fast time at all! I started out at a pretty good pace, but slowed down significantly about half way through the run. My knee felt fine. My breathing didn't slow me down at all and my legs felt great. The problem was my feet! More specifically, the bottoms of my feet! I developed a couple nasty blisters during the run. I thought about posting a picture of the blisters, but thought better of the idea. They are not a pleasant sight. I do all my training in these shoes and I love them! Once you get used to wearing them you start to feel as if you are barefoot. The problem with them is long runs. There is very little padding in these shoes. If you are not accustomed to running, like me, it is easy to develop blisters on your feet during long runs. 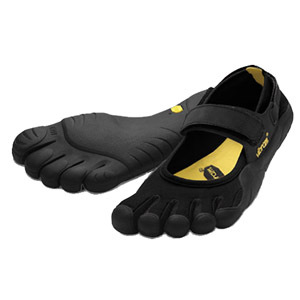 Vibram has developed a Fivefingers shoe specifically for running called the Bikila. These shoes have a lot more padding where your foot strikes the ground while running. It will be interesting to see how much time I can shave off my next 10K with different footwear. I may not use the Fivefingers Bikila, but perhaps another low profile shoe with more padding. that bottom picture of the bikilas looks like my new ones! Are your vibrams loose at all? I found if they are not snug any movement at all will irritate your foot. The vibrams you were aren't bad if they are new, I tried that pair you gave me and they were fine at first but after using bikilas when I went back to them I couldnt wear them. Nice job on the run! @Chuck I just got a new pair of Vibrams. They are pretty snug. My feet felt fine through about 3.5 miles then I felt the blisters. I think my feet just aren't used to that much running volume. After the blisters heal I'll have a couple nice calluses on my feet to protect me for my next run!